On many occasions I have considered making my own contributions to the “Wordless Wednesday” meme. Unfortunately, I find it impossible to post photos of insects and not be allowed to say anything about them. I suppose I could follow Dragonfly Woman‘s “Well-Nigh Wordless Wednesday” example, but that seems like horning in on somebody’s trademark. At last it finally occurred to me a meme that I could use for Wednesday’s that gets around these issues—”One-Shot Wednesday”! Ever photograph an insect and only get off a single shot? Not just one keeper from a series of photos, but only one single photo of the insect, like it or lump it! That’s what I’m talking about here. The subtext, of course, is that there was only that one chance to get everything right—exposure, focus, composition, lighting, etc. Obviously, it’s not my plan to show crappy photos as part of this meme, but rather that occasional instance where I only got off a single shot, and for the most part everything worked pretty well to produce a decent photograph. I would, of course, be more than happy to see this meme take off and spread throughout the insect blogging community, but if it doesn’t and it remains a BitB exclusive then that’s fine also. Here is contribution #1 in the meme: a leaf-footed bug (family Coreidae) feeding on flowers of Solidago chilensis that I photographed a couple of weeks ago near Corrientes, Argentina. According to coreid-specialist Harry Brailovsky (Universidad Nacional Autónoma de México), the expanded hind tibiae place it in the large, mostly New World genus Leptoglossus. Which one, however, is a good question—according to Coreoidea Species File Online, ten species in the genus have been recorded in Argentina, but browsing through available images didn’t immediately turn up a good match for the individual shown in this photo. I’ve often wondered about the purpose of the leaf-like expansions of the hind tibiae of coreids—which reach truly gargantuan proportions in some tropical species—and their adaptive significance. One can imagine they might serve as a “false target” for potential avian predators, and supporting this idea is the fact that the hind legs seem to break off rather easily when handled. It’s not rare to find individuals in the field missing one or even both hind legs. 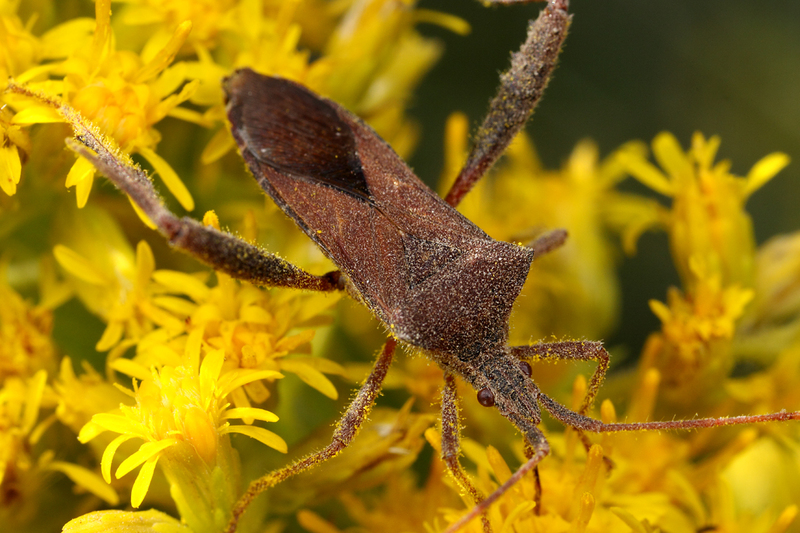 This entry was posted in Coreidae, Hemiptera and tagged Argentina, entomology, insects, leaf-footed bugs, memes, nature, One-shot Wednesday, science. Bookmark the permalink. Nice one. To me, the leaf-like things on the tibiae appear cryptic–they break up the outline of the legs, and thus, the insect-like appearance of the whole body. Could be. Another thought I had was sexual signaling, since often there is some dimorphism in the degree of development between males and females. Actually there could be multiple selective pressure acting in concert. Do I need to say something about the insect? I only take photos and then don’t know what it is! Oh, I LIKE this challenge. Very tricky. Since I’m still getting the “feel” for my camera under different field conditions, I usually need a couple of shots to get the lighting correct. I do beleive I will give this a try and contribute next week. Meanwhile, that’s a pretty darn decent shot for a one-off!!! Perfect G+ tag – it’s over there now. Congrats on being included in WordPress’s Earth Day Nature Blogs email! I am always happy to see coleoptera and those who love them acknowledged. Thanks kentiki, although it seems my wide-eyed owl rather than any of the beetle photos was what caught their attention. Fab photos. I LOVE insects. I’m so pleased I was directed here! I’m doing the A-Z challenge one blog a day through the alphabet at the minute of endangered animals, and have several insects. Thank you Liz – I hope you find enough here of interest to come back. Here in central Texas we have plenty of “leaf-footed” bugs. Last year I photographed what someone identified for me as Leptoglossus phyllopus. Your speculation about the reason for such large hind tibiae is certainly plausible.